In an earlier post I celebrated the announcement that the US Federal Reserve intended to publish interest rate forecasts. It has now done so. Here is the key chart. 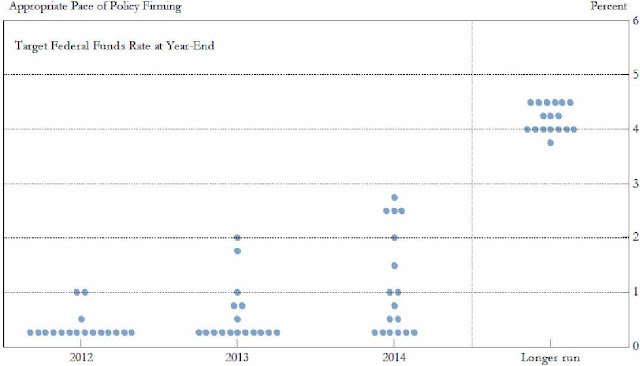 The vertical axis in the level of expected interest rates. On the horizontal axis we have four points in time: the end of 2012, 2013, 2014 and the long run. 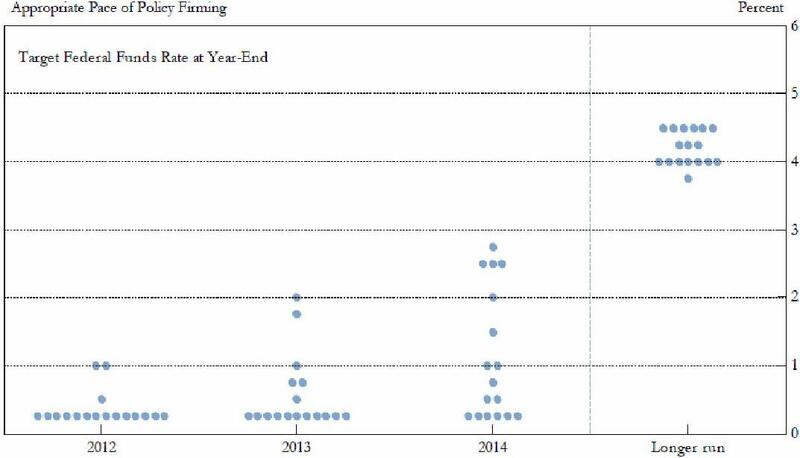 Each dot represents the expectation of one of the FOMC members (roughly the equivalent of members of the Monetary Policy Committee in the UK). The Federal Reserve example also weakens two of the standard arguments against the Bank of England doing the same. The first argument is how you get all the MPC members to agree a forecast. As the above shows, you do not. Each member of the MPC says what they think. The second argument is that the public will confuse conditional forecasts with commitments. However, unless every MPC member has the same forecast (which seems unlikely), what you get is alternative opinions, so clearly this is not some kind of unconditional target for interest rates. The central bank of New Zealand has been doing this for years, and those of Sweden and Norway for some time now. Those central banks have not decided it was a horrible mistake because the public did not understand what it was doing. However, these were relatively small economies, so the Bank of England could brush their experience to one side. Now that the US has followed in their footsteps, I believe the Bank has to move in the same direction. Some comments on this recent post about Schools of Thought macro have raised interesting issues which I had not thought enough about, and which I want to come back to later if I can. Here I want to put forward an idea suggested by this from Jonathan Portes. We wrote these posts simultaneously and independently, and although I think Jonathan’s is consistent and complementary with what I had written, rereading it made me think a bit more about what I was really annoyed about. Jonathan describes his puzzlement at being labelled a Keynesian when he thought he was just following mainstream macroeconomic theory and evidence. It discusses how misleading it can be to associate views about how the economy works with policy positions which may be rather specific in time, place and circumstance. Now I think these types of criticism, which I made in my original post, apply to at least some other schools of thought in macro. For example the label monetarist has many layers of meaning, from the very specific and policy related (money supply targeting) to the much more general and theoretical (money matters). These layers may be related, but they do not have to be. Having said that, I think it is worth saying a bit more about the use of the specific term Keynesian, which both our posts focused on. It seems to me slightly unusual when used to denote a school of thought today, because it appears to be invoked more by those who disagree with it than those who agree. Jonathan’s post gave some clear examples of this. To caricature: we do not need to think too much about fiscal stimulus, because it’s a Keynesian policy. It is true that this kind of statement is more often made by politicians, journalists or bloggers than academics, but academics are not blameless here, and others often take their cue from them. The source for dismissive statements of this kind probably goes back to the 1980s. At the academic level, it reflects the defeat of the Keynesians at the hands of New Classical economists, without noting that things have moved on rather a lot since then. At the level of policy in the UK, it may also reflect a perception on the right of past battles won. In contrast, those economists who use (New) Keynesian theory generally think they are just applying standard macroeconomic analysis. They are using the synthesis (e.g. the New Neoclassical Synthesis of Goodfriend and King) that I talked about in that earlier post. They do not think of themselves as members of a school of thought – they thought they were part of the mainstream. So I want to abolish the Keynesian school. Keynesian analysis should be part of the mainstream, and does not need to be embodied in a school of thought. However, for those that like schools of thought, I will replace it with a new one: the anti-Keynesian school of thought. It covers all those who attempt to dismiss Keynesian ideas like fiscal stimulus at the zero bound, or countercyclical fiscal policy in a monetary union, not through reasoned analysis, but by just labelling it Keynesian. When I first studied macro, it was all about ‘schools of thought’. Keynesians, Monetarists, New Classicals, and probably many more I cannot remember. Macroeconomists tended to take sides. Antagonists often talked across each other, and anyone not already on one side just got totally confused. I recall reading one textbook on international macro where each chapter represented an alternative ‘view’, with no clear idea of how each view or school was related to another. One thing that was pretty clear, however, was that most schools of thought could be identified with a particular ideological position. But then things began to change. The discipline appeared to become much more unified. It would be going much too far to suggest that there was a general consensus, but to use a tired cliché, most macroeconomists started talking the same language, even if they were not saying the same thing. I think there were two main reasons for this. The first was microfoundations: deriving the components of macro models from standard optimisation applied to representative agents. This gave macroeconomics the potential to achieve the same degree of unity as microeconomics. The second was the development of New Keynesian theory, which allowed an analysis of aggregate demand within a microfounded framework, and which integrated ideas like rational expectations and consumption smoothing into Keynesian analysis. To use the jargon, all models were now DSGE models. Goodfriend and King coined the term ‘New Neoclassical Synthesis’ (call it ‘synthesis’ for short), and other authors wrote along similar lines. So, even as recently as five years ago, I told masters students starting a macro course to forget anything they might have been told about alternative schools of thought: they were going to learn a unified framework that most macroeconomists – the mainstream – would sign up to. It was like the first half of David Romer’s popular textbook: start with Solow, but quickly replace a fixed savings propensity by an optimising intertemporal consumer to get the basic Ramsey model. Add endogenous labour supply to get RBC. Probably talk a bit about overlapping generations. Hopefully add to what was in Romer by doing some open economy stuff. Then add New Keynesian theory built around sticky prices. If the student went on to work in a central bank, they would probably encounter this framework as a central part of that institution’s forecasting and policy analysis. I think this synthesis and the reasons behind it may have had one or two unintended and unfortunate consequences. Sometimes the emphasis on microfoundations became a bit of a fetish. (I have written about the shaky methodological grounds on which ‘microfoundations purists’ sometimes stand here.) Some have suggested that the emphasis on microfoundations meant too much time was devoted to elements that were easy to model within that framework rather than the things that really mattered. But I personally thought this synthesis had many more positive than negative consequences. I would not wish for every single macroeconomist to sign up to the synthesis: there is an important role for heterodox economists. However I liked the fact that the majority of macroeconomists used the same analytical framework. Just five years later and it seems rather different. I’ve encountered a much larger range of economics blogs in the last week or two (you can guess why), and it does feel like going back in time. Schools of thought in macro are definitely back. Since the recession it has become clear that the synthesis had not been adopted everywhere. In particular, in sections of the profession there remained a suspicion (to put it mildly) of New Keynesian theory, and partly as a consequence of this the amount of this theory that was taught to graduates differed widely. It is true that for some, schools of thought can be quite fun. Some students find the idea that academic macroeconomics consists of opposing forces locked in combat adds a degree of interest and motivation that might otherwise be lacking. However I am not persuaded that this spice was sufficient to offset misunderstanding. Personally when I was a student I found all the motivation I needed from socially destructive inflation, and widespread unemployment should do the same today. I do think that the schools of thought approach leads to an inexactness which can be misleading and annoying. Take the label Keynesian. Look up Wikipedia, and in the third paragraph you will find ‘Keynesian economics advocates a mixed economy — predominantly private sector, but with a significant role of government and public sector...’. Now I have a much more limited idea of what Keynesian economics is. For me, Keynesian macro is business cycle analysis based on aggregate demand and sticky prices. By this definition, the only ‘significant role for the public sector’ required is a central bank. Even in the rather unusual (I hope) times of a zero lower bound, Keynesian advocacy of fiscal stimulus implies is that the government brings forward its bridge building, and not that it permanently build more bridges. Does my preferred definition make me narrow-minded? Keynesian analysis as I define it implies that you need monetary policy, and occasionally countercyclical fiscal policy, to stabilise the economy, but that is not what is generally meant by a mixed economy! The extent of the public sector’s involvement in the economy will depend on microeconomics, not macro. Now it is true that those who tend to be antagonistic to state intervention may be uncomfortable with monetary and fiscal stabilisation policy, as I have suggested, but I am against ideology clouding economics, and I certainly do not want this connection hard wired as a school of thought. School of thought thinking also tends to bracket ways of looking at the economy with policy prescriptions, even when they are not inextricably linked. Take countercyclical fiscal policy, for example. Is that an intrinsic part of Keynesian thinking? For some time there has been general agreement among most macroeconomists that monetary policy was the stabilisation tool of choice, because of issues like implementation lags. This view has been strengthened by analysis over the last ten years that explicitly looks at welfare derived from a representative agent’s utility: the analysis of a simple basic case is contained in the Woodford paper I referenced here, and some of my own collaborative work has shown this result is surprisingly robust. So linking the routine use of countercyclical fiscal policy to what I think of as Keynesian theory is just misleading. This sort of bundling together of ideas under one label at the very least causes confusion. (Here Jonathan Portes gives one recent example.) Worse still, it leads people to take sides on issues not because of the merits of the case, but because that case is associated with a school of thought whose other elements they do or do not like. I also miss the synthesis. I very much liked the idea that disagreements could be clearly located within a common framework. With the synthesis, I felt macroeconomics began to look more like a unified discipline - more like micro, and dare I say it, more like a science than a belief system. So two very different views, but one reason for this divergence may be that they are mainly looking at different crises. Although Bergsten and Kirkegaard note the competitiveness problem I discussed here, they focus on government debt. They note that, although the ECB has the capability of ending the crisis, to do so would create too much moral hazard. To quote: “Were the ECB to cap governments’ financing costs at no more than 5%, for instance, Eurozone politicians would probably never take the essential but painful decisions.” In other words, it is in the ECB’s perceived long term interests to allow a crisis to persist, because this will spur on institutional reforms that will avoid a similar debt crisis occurring in the future. To some the idea of progress via crisis might seem far too chaotic. Why, for example, cannot the ECB systematically buy or sell government bonds in the market to achieve announced target interest rates for particular countries, and reduce interest rates for those countries that make progress in tackling debt problems, but raise rates for those that do not? In one sense this is what the market is doing, but while the market might have the general level of interest rates too high because of problems of multiple equilibria, the ECB could provide incentives in a more moderate and controlled way. Perhaps, but I doubt whether the ECB would want to play such an openly political role. Under this view, the ECB’s policy is working just fine. European politicians are being forced to make changes (and in some cases are being forced from office when they do not), and institutional progress is under way. Because such changes are difficult politically they are bound to be slow and erratic, which is why the apparent crisis will continue for some time to come. But, so the argument goes, if at any stage the crisis appeared to be becoming critical, the ECB would step in to avoid this happening. Paul De Grauwe and his colleagues are worried about a different crisis, a crisis of external imbalances. I think I’m right that as far as my discussion here is concerned, this is equivalent to a crisis of competitiveness. Eurozone countries running current account deficits have been losing competitiveness, and vice versa. To cure this crisis requires deficit countries to restrain demand, and surplus countries to expand demand. Now the first part of this cure is of course identical to the cure for excessive government debt – it requires fiscal austerity. The key difference is the second part, which involves expansion in surplus countries. It is the absence of expansion in surplus Eurozone countries (which means Germany in particular) that leads De Grauwe et al to be so pessimistic. They see a “decade of economic stagnation entailed by current policies “. If European policy makers do not change course, they “will bear the responsibility for the implosion of the eurozone and, in the end, the failure of the whole European project”. Many others share this concern about a Eurozone recession: see Martin Feldstein for just one example. The first estimate of UK growth in the last quarter of 2011 was negative. As these updated NIESR charts show, no other UK recovery has stalled in this way. Of course very little is ever certain, but we can be pretty sure that growth would have been significantly better if the current government had not imposed severe additional austerity measures beginning in 2010. (This is the counterfactual that matters, and just looking at GDP components can be a misleading way at getting at this for reasons I discussed here.) Of course growth might have been better too if the Euro crisis had not happened, but this government had no control over the Euro crisis, while it does decide fiscal policy. I do not have anything very new to say about this, in part because many people predicted growth would be harmed before the policy was introduced. (See, for example, this letter from 80 economists published during the 2010 election campaign.) What was the reason for this major macroeconomic policy error? For some I think it was a political calculation that it would be advantageous to get as much of the cuts out of the way early, well before the next general election. However I think others in the coalition were genuinely spooked by events in Greece and elsewhere. Unfortunately the key difference between economies in the Eurozone and those with their own central bank was not appreciated. Today the claim that if these additional austerity measures had not been introduced UK interest rates on debt would have suffered the same fate as many Eurozone countries looks pretty implausible. In Denmark we even have an example of a country that has recently undertaken stimulus measures, and where interest rates have continued to fall in line with other countries outside the Eurozone (see David Blanchflower here). So I believe we must add 2010 to a list of major macroeconomic policy errors made in the UK since the war. Like the failed monetarist experiment in the early 1980s, it is the result of a government adopting a policy which relied on a mistaken macroeconomic analysis that was not supported by the majority of academic opinion. And like that earlier failure, it will leave unemployment significantly higher than it need to have been for many years. They have lost the Keynesian argument (for now): the paradox of thrift is just too paradoxical for the public. I agree that the line that the recession was caused by everyone (public and government) borrowing too much, and that just as consumers are now having to tighten their belts, so should government, plays well because it seems virtuous. On the other hand the idea that if consumers and government start to save more at the same time there will not be enough demand and so output will fall seems fairly intuitive, and certainly not rocket science. However I’m not really in a position to judge how someone unfamiliar with macroeconomics would see this argument, and I guess it is called a paradox for a reason. Obviously Toynbee is not implying that every macroeconomic idea that is incomprehensible to the layperson will be ignored by policymakers. What she does seem to be saying is that when macroeconomics enters politically contested waters, politics should look to what goes down well with the public rather than what most economists think is right. Is this true? Well just imagine the following. The opposition announces that it intends to cut most tax rates. It asserts that this will incentivise everyone to work harder, so tax revenues will actually increase. Now I’d like to think that if this happened in the UK today, the media would find it very difficult to get hold of an academic economist who would support the view that revenues would actually rise following tax cuts. The opposition would be asked at every turn, why do the experts not agree with you? As a result, although the policy might be popular initially, it would gradually lose votes. In addition, the opposition itself might begin to doubt their own claim. Now imagine another country where there is a small minority of economists who are prepared to support this view. The media would switch to describing the claim about revenues as controversial, and would revel in setting up confrontations between economists on opposing sides. The opposition gets elected and implements the policy. Similarities between this and the story of the Laffer curve and Ronald Reagan that Paul Krugman describes in Peddling Prosperity are of course deliberate. It therefore seems to require a near universal consensus among economists to prevent bad but populist policies either emerging in the first place, or being enacted if proposed. We need to add at least two other factors that might be important. The first is the influence of academics on the civil service. Civil servants do try and weigh up the evidence, and will be influenced by whether a particular view is a majority or minority one among academics. However politicians can override civil service advice, particularly if they have an electoral mandate, as my little story about the first Thatcher government illustrates. Second, we need nowadays to factor in the role of think tanks which are established to promote a particular point of view, and which can often manufacture apparent expertise. (There is a very nice observation from Menzie Chinn on how many staff from various US think tanks went to the ASSA meeting in Chicago. George Monbiot follows the money financing UK think tanks.) Such think tanks can generate the appearance of ‘controversy’ among experts where little actually exists, as the climate change debate illustrates. What this all suggests is that the academic balance of opinion on macroeconomic issues carries very little weight when these issues are politically divisive. The chances of achieving the near consensus required for academic opinion to matter is also reduced by the two way interaction between politics and academic economics. Not only will politicians and their advisors seek out the academics whose views support their political prejudices, but unfortunately ideology sometimes seems to influence the academic debate. I have written about the influence of free market ideology on academic macroeconomics in the context of fiscal policy and Keynesian theory more generally, but in the past the influence has come from the left as well as the right. All this is very pessimistic from my point of view. Indeed, as the paradox of thrift is both a very old idea and obviously correct, it is enough to make someone who wants better policy despair. In another 75 years, will the paradox of thrift still be a ‘controversial’ idea in media terms? I think it may just be possible to tell a more optimistic story on this, but that will have to wait for another post when I'm feeling less gloomy. In the UK we can get into the same confusion. Was 2011 a bad year for growth because of the greater austerity announced in 2010? We will have the Office for National Statistics’ first guess at the outturn for 2011 as a whole soon, but they should not be too far from the forecast made by the OBR in November. The OBR (Office for Budget Responsibility) is the UK’s equivalent of the Congressional Budget Office, although it is much smaller and has a much more limited remit. Brian Ashcroft, in his new blog, runs through the OBR’s estimates with some nice charts. Overall UK GDP growth in 2011 is expected to be just less than 1%, but the contribution of government spending to that growth is expected to be positive. Does that mean additional austerity had nothing to do with the recovery stalling in 2011? The answer is no for a number of reasons. First, as Ashcroft notes, government spending in the UK and elsewhere is typically countercyclical. We normally focus on transfers like unemployment benefits when thinking about why the budget deficit goes up in a downturn, but there is evidence (for example this study by Julia Darby and Jacques Melitz) that government spending is also countercyclical. In other words, without austerity the contribution of government spending to growth might have been bigger still. Second, one of the government’s key austerity measures was an increase in VAT at the beginning of 2011. As this was preannounced, I would expect a lot of expenditure switching from 2011 into 2010, and indeed falling consumption (-1.1%) is the major reason why expected growth in 2011 is low. Third, people look forward and adjust their current plans accordingly. The OBR expects the direct effect of government spending to reduce growth in a major way over the next five years. That inevitably means job losses in the public sector: the OBR expects general government employment to fall by about 700,000 (about 2.5% of total employment) between 2011 and 2017. It would be very surprising if this had not led to an increase in precautionary saving in 2011. What we really want to know is what GDP growth would have been if the new coalition government in 2010 had not announced additional austerity measures. To do that you need a macroeconomic model, like the one the OBR uses to make its forecast. In fact the OBR are the obvious people to ask, but unfortunately – and unlike their US counterparts - they are not allowed to tell you, or even do this kind of analysis. Read this to find out why. Jonathan Portes has a nice chart comparing this recession to previous downturns in the UK. The most eye catching implication is the similarity between this recession and the 1930s. Although it appeared as if we were recovering more quickly, thanks to the rapid reduction in interest rates and fiscal stimulus immediately following the recession, additional austerity brought in by the new coalition government has coincided with a much slower recovery. Whether this is causal we cannot be sure, but in my view it would be very surprising if the additional austerity was not at least partly to blame. I want to focus on a different comparison, between now and the recession of the early 1980s. These recessions were both severe, but their immediate causes were quite different. The recession that started in 1980 was the consequence of a very tight monetary policy designed to reduce inflation. RPI inflation averaged 18% in 1980, but came down to 5% by 1983. GDP fell by over 2% in 1980, and very slightly in 1981, but an unusual feature of the recession was that it was concentrated in the traded sector: manufacturing output fell by 15% over those two years. One possible explanation is ‘Dornbusch overshooting’: using monetary policy to reduce inflation in an open economy leads to a temporary loss in competitiveness that hits the traded sector. The similarity with today lies in fiscal policy. In the 1981 budget, income tax allowances were not raised, despite rapid inflation. To put the same point using a bit of jargon, in 1981 the ‘automatic stabilisers’ provided by fiscal policy were switched off. Despite high and rising levels of unemployment, fiscal policy was tightened, as it was in 2010. At the time I was working as a relatively junior economist in the UK Treasury, in charge of using the Treasury’s macroeconomic model to assess the economic impact of the budget. This sounds very important, but in practice it was not, because those in charge of policy did not believe the analysis that the model produced. Traditionally after every budget, the chief economic advisor, who was then Sir Terry Burns, presided over a discussion of all Treasury economists about the issues raised. Sir Terry began by presenting his analysis of why fiscal policy had to be tightened: the large budget deficit was in danger of making it difficult to hit (broad) money supply targets. When he finished, there was silence in the room. Given my role at the time, I felt I could not let this pass. I delivered a little speech suggesting the budget was totally inappropriate. It is what happened next that was noteworthy. It was like opening the floodgates: suddenly everyone wanted to speak, and with few exceptions the verdicts were equally damning. Sir Terry looked increasingly uncomfortable. This pattern was mirrored in public through the publication of a famous letter to the Times signed by 364 academics. We are more used to such things today, but in 1981 this was a very unusual event, and to get so many distinguished academics (mostly economists) to express such a strongly critical view of government policy was a big deal. The 364 included Amartya Sen and the current governor of the Bank of England, Mervyn King. To look at the exact text of the letter is a bit of a distraction, as it included many statements which look decidedly odd today, and which I am sure many of the signatories at the time did not fully agree with. They signed it because they thought the policy was wrong. I think it is therefore reasonable to use this letter as a proxy for the 1981 budget itself. In 2006 a number of journalists and commentators marked the 25th anniversary of the letter. Here I want to quote from the end of a piece written by Stephanie Flanders, because I think she is a reliable guide to what the verdict at that time was on the 364. And the letter itself? Well, unfairly or not, the letter became something of a joke on the economics profession, as Lord Howe [Chancellor at the time] confirmed. "I've actually produced a definition of economists as a result: that an economist is a man who knows 364 ways of making love, but doesn't know any women." Was it right, given hindsight, to switch off the automatic stabilisers in 1981? In very simplistic terms you can argue both ways. Growth did pick up after 1981. Inflation came down rapidly, perhaps more rapidly than was intended. Unemployment stayed very high for the rest of the decade, clearly suggesting that the deflationary shock in 1980/1 was so sharp that it generated hysteresis, raising the natural rate for some time. This is the point emphasised by Steve Nickell, who probably has done more work on the UK unemployment/inflation trade-off over this period than anyone else. However in one crucial respect 1981 was not like 2010, in that monetary policy was still operating freely. If switching off the automatic stabilisers in 1981 had allowed an easing of monetary policy, and given how uneven the impact of monetary policy had been, then perhaps it made sense. However the conventional view today is that monetary policy should do all the work if it can, and that fiscal policy should just allow the automatic stabilisers to operate. So it seems to me that the question of whether the 1981 budget, or the 364 economists’ protest, was right or wrong remains an interesting question. However the point I want to make here is that the view on the political right is quite clear. This piece by Phillip Booth in the Daily Telegraph from 2006, based on editing a collection of essays on the issue published by the Institute of Economic Affairs, is headlined ‘How 364 economists got it totally wrong’. So my speculative question is this. Was this verdict on the 1981 budget influential (explicitly or implicitly) when the Conservative party in opposition decided that more austerity was needed? (I have focused elsewhere on the role of Greek default in changing the policy consensus worldwide, but the Conservative Party opposed Gordon Brown’s countercyclical policy from the start of the recession.) Did the verdict on the 364 embolden the view that it was OK, and possibly even desirable, to go against conventional (in the UK at least) academic opinion? If this verdict on history was important in influencing policy in 2010, was it appreciated that being at the zero lower bound today made the two periods crucially different? This post is for first year undergraduate students (and the occasional blogger) who appear confused. Thanks to Chris Dillow and then others, my post Mistakes and Ideology in Macroeconomics was widely read and commented on. As Chris pointed out, it is possible to think in terms of mechanisms or complete models. My post was about one mechanism, consumption smoothing, which the texts I was looking at appeared to ignore. Many responses were along the lines of ‘what the authors of these texts had in mind is a model of this type, and in this type of model fiscal policy will be ineffective’. I’m happy to pursue this, not because I would be presumptuous enough to imagine I know what the authors ‘really meant’, but because I think it strengthens the idea that antagonism towards fiscal policy in the current situation has ideological roots rather than a sound basis in macroeconomic theory. The most widely suggested model is one where there is never any demand problem: we are always at ‘full employment’. Then, of course, increasing one component of demand will have no direct effect on output, and higher taxes will have some negative impact on supply. Expansionary fiscal policy would be quite inappropriate in these circumstances. If that is the argument, then I would insist on asking just how it is that the economy is always at full employment. The standard response, which is that prices are flexible, is not enough when we hit a zero lower bound for interest rates. As a suggested in another post, the ‘self correction mechanism’ by which demand shocks never impact on output requires a combination of price flexibility and monetary policy. (Actually, price flexibility is not even necessary – if the monetary authorities effectively targeted the output gap, for example.) This mechanism fails when we hit a zero lower bound. Now an argument that said that the current recession was the result of a large negative supply shock rather than a demand shock, and we hit the zero lower bound because central banks misunderstood this fact, makes perfect sense in theory – it is just a little difficult to square with the facts, as many have pointed out. But this is a contingent argument. What the debate over fiscal policy has revealed is an underlying generic antagonism towards Keynesian analysis. There is an asymmetry here. Keynesian economists do not deny that productivity or other supply side shocks can often be important. On the other side there appears to be, among many at least, a belief that Keynesian economics is never relevant. What this amounts to is what Krugman and others call demand denial. Yet the basis in economic theory for demand denial appears very unclear. Say’s Law, or maybe some kind of quantity theory with fixed velocity, would do it – but these were really bad ideas that the profession dismissed many decades ago. Demand denial seems both surprising (an individual firm facing a fall in demand will reduce output), and hardly something to feel passionate about. So demand denial genuinely puzzles me. Keynes had a number of thoughts on this, as the following from the General Theory shows (‘it’ in the first sentence is a theory that involves demand denial). That it reached conclusions quite different from what the ordinary uninstructed person would expect, added, I suppose, to its intellectual prestige. That its teaching, translated into practice, was austere and often unpalatable, lent it virtue. That it was adapted to carry a vast and consistent logical superstructure, gave it beauty. That it could explain much social injustice and apparent cruelty as an inevitable incident in the scheme of progress, and the attempt to change such things as likely on the whole to do more harm than good, commanded it to authority. That it afforded a measure of justification to the free activities of the individual capitalist, attracted to it the support of the dominant social force behind authority. Now beautiful though this passage is, a good deal has changed since 1936. New Keynesian theory is a ‘consistent logical superstructure’, so there is no intellectual prestige involved in denying its relevance (except, perhaps, to fellow believers). Yet two sentences still ring true. The first is the idea that austerity is virtuous. Some of the popular discourse around fiscal policy has moral overtones, perhaps stemming from the idea that governments, like individuals, have to practice self control. Now while I think seeing economics as a morality play is generally unhelpful, in the case of fiscal policy there is a problem of deficit bias: governments over the last few decades have tended, on average, to spend too much or tax too little. (Some particular evidence, and a fairly comprehensive discussion of reasons for deficit bias, can be found here. For lots of data, go here, click on ‘subject: Real GDP Growth’ and select the historical debt database.) However deficit bias is a long term problem and a recession is not the time to start dealing with it. The final sentence from Keynes also still rings true. One explanation for demand denial is that it has ideological roots. In the real world we have the problem of ensuring aggregate demand matches supply, and this requires state intervention – normally monetary policy. For those who want to argue that state intervention in the economy is generally a bad thing, it is embarrassing to acknowledge that there is one area where it is essential. But I get no joy in seeing ideology mess with economics, and so I would be more than happy to be convinced that there was another explanation for demand denial.